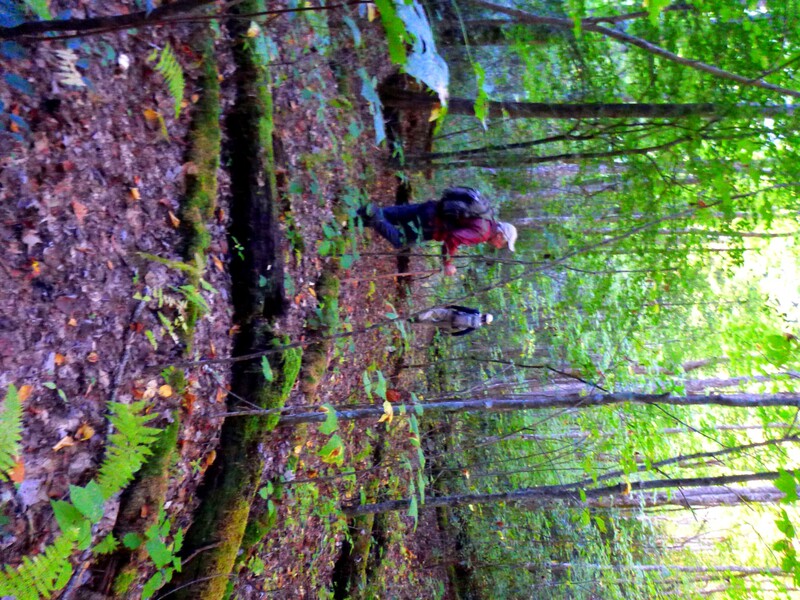 Last fall I scouted this hike with Mark Shipley and Ed Fleming. It was to be an outing for the Smoky Mountains Hiking Club. 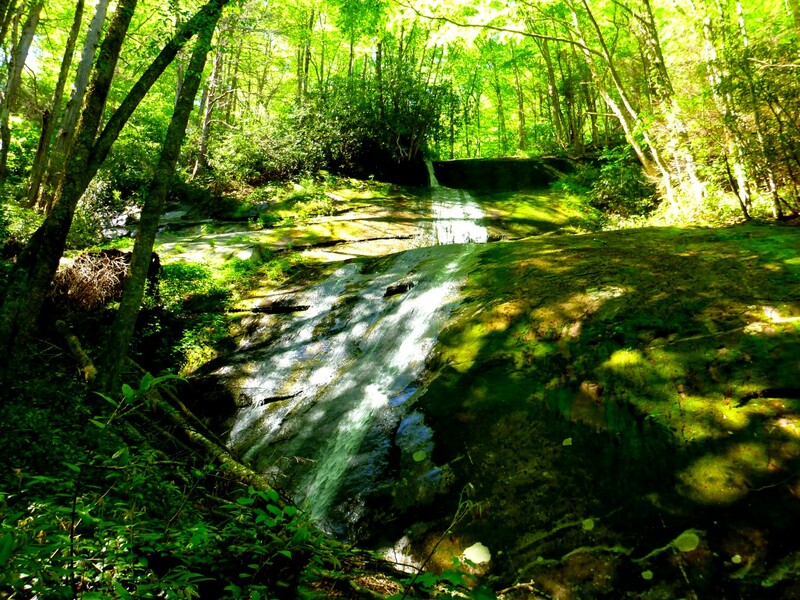 It is a strenuous hike, going off-trail from the lower waterfall that can be seen from the Big Creek trail and rockhopping up Mouse Creek, a climb of 4000′ vertical feet to get to the Mt. 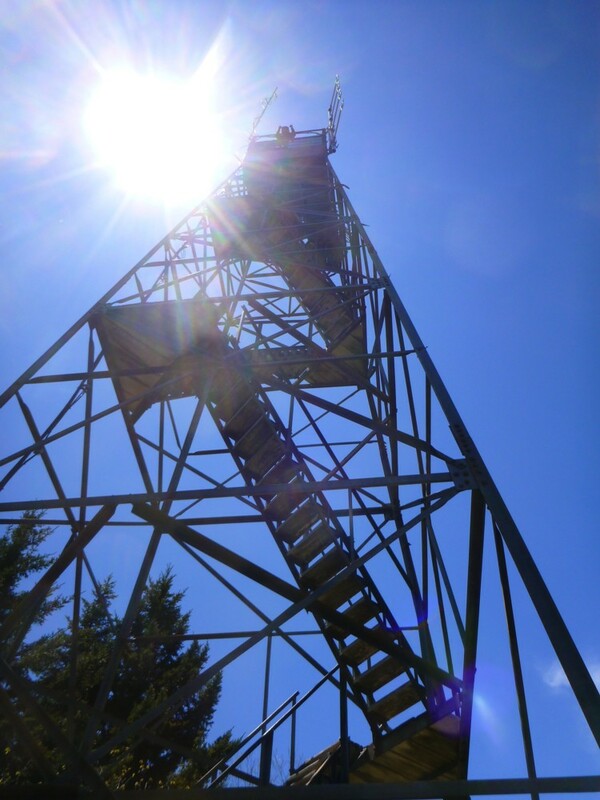 Sterling fire tower. Think of the Baxter Creek trail and then consider how much harder it is to do the same climb without benefit of a trail. Mark and Ed decided to limit the number of people who could go. It is part of an SMHC initiative to avoid the environmental impact of a large number of people trampling through the forest. I will say, however, that I believe trail hikers have a much greater impact on the forest than the small numbers of scattered off-trail hikers venturing into places few people go. 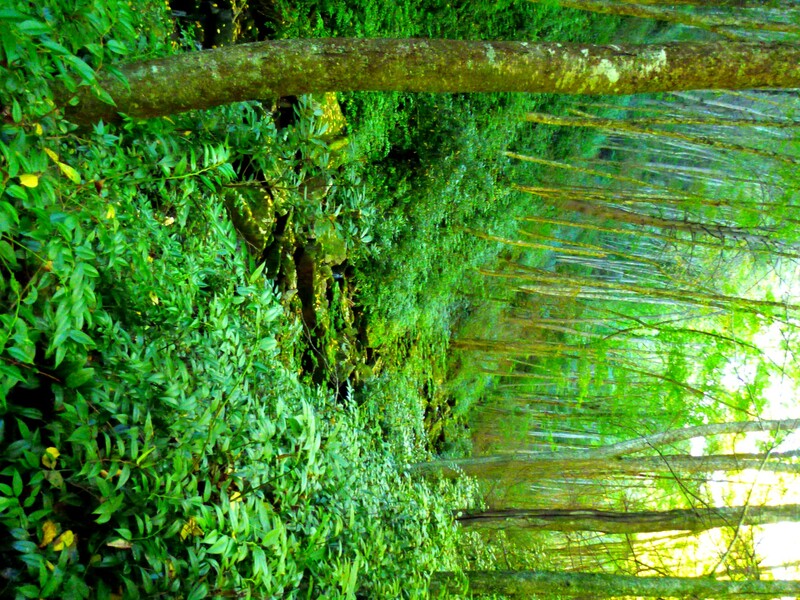 The way I think about it, the forest is so robust that the hikers are the ones on the defensive, not the woods! If you have ever waded through waist-deep doghobble or wormed your way through a rhododendron thicket, you might understand what I mean. However, I respect the decision of the leaders and value the intention behind it. At any rate, I decided not to join the club hike because I’d been there on the scouting trip and didn’t want to deprive anyone who hadn’t been there before from taking one of the six slots available. Of course, after I made that decision I had pangs of disappointment. I realized that I truly didn’t want to miss out on the experience. So I came up with a plan. 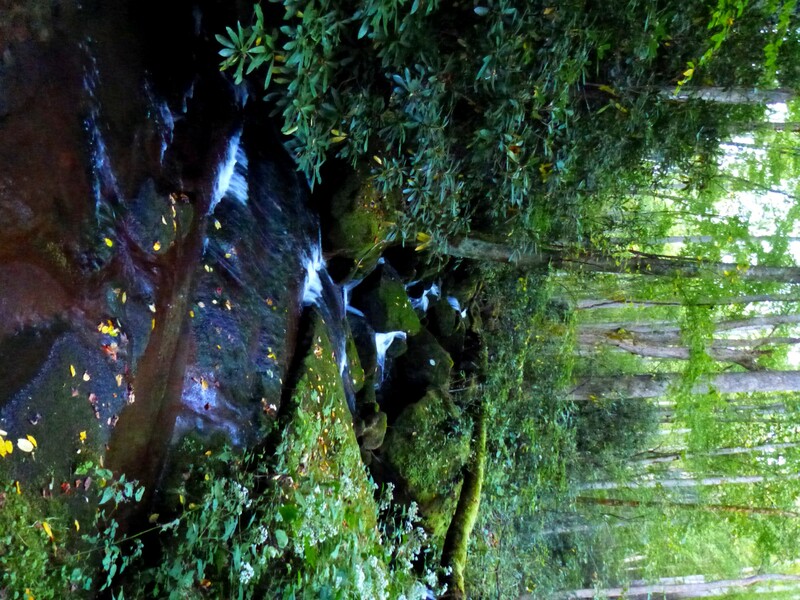 I would go ahead of the group and meet them at the upper Mouse Creek falls. I kept my plan secret. I arrived an hour and a quarter before the group meeting time and parked at the ranger station a mile away because I knew people would recognize my car. I was so determined to stay ahead of the group that by the time I reached the falls I had expanded my lead time to an hour and a half. As it turned out, that was a mistake, because I burned myself out and ran out of steam on the upper section. I meet with the group at the falls (I am in the purple jacket). Photo by Mike Harrington. 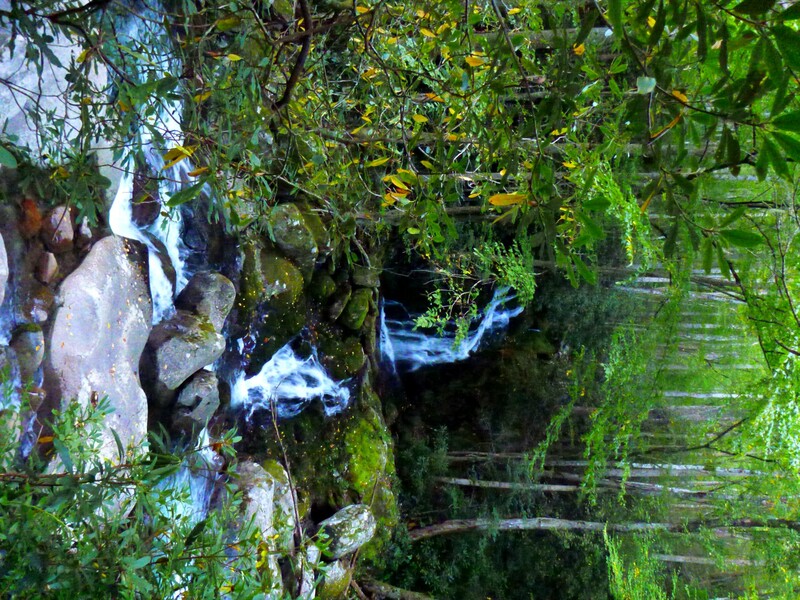 The falls is at 3560′, or only halfway to the top. We continued along an old logging grade for a while, but where the vegetation got thick, we returned to the stream itself. I dragged more and more behind the group, embarrassed to make such a poor showing for myself. We reached the tower and experienced beautiful views from the top on this crystal-clear day. We all had different schedules so split up into different groups for the return down the Baxter Creek trail. I walked down with Cindy McJunkin, enjoying our conversation about the plants we encountered and many other subjects. Despite the odd difficulties I experienced, I’m glad I decided to join the group. Daredevil Greg Harrell climbed through a hole in the roof of the tower and stood on top! Notice how the cascade starts way up on a distinct upper level. 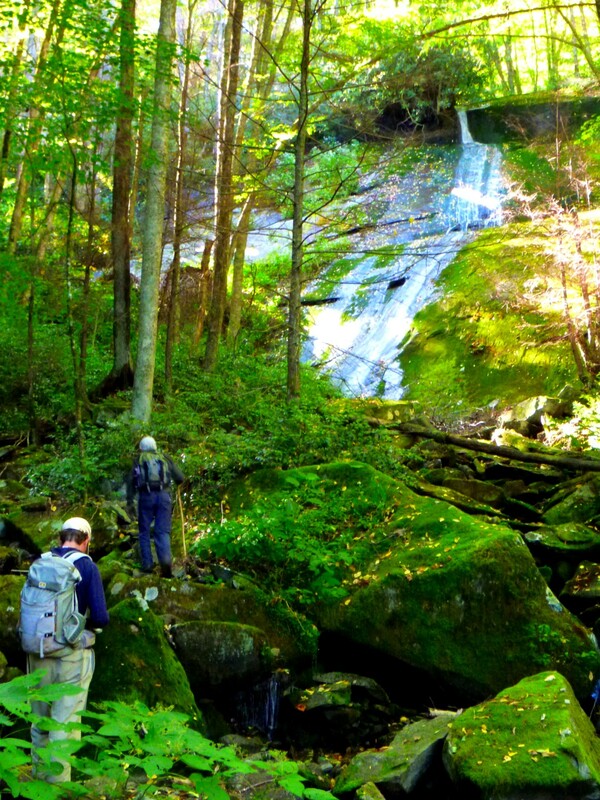 Today Mark Shipley, Ed Fleming, and I scouted a route that will be on the program of the Smoky Mountains Hiking Club next May. It has so much to recommend it. More than anything else, the magical cascade on Mouse Creek at 3560′ elevation makes the trip worthwhile. But if that isn’t enough for you, consider also these factors: (1) It is a great hike for people who like the challenge of a significant climb—in this case 4,000 vertical feet; (2) The going was relatively easy, making use of old logging grades up to nearly 5000′ elevation; (3) You can see interesting old artifacts from the logging days; (4) Most of the time the vegetation was not bad, by Smokies off-trail standards, more dog hobble than rhodo; (5) You get the view from the fire tower! We met up at 7:00 this morning at the Big Creek trailhead, right before dawn, because Mark (who will lead the hike) rightly considered that the journey along Mouse Creek could turn out to be incredibly time-consuming. As it turned out, we reached the fire tower by 1:15 and were back at our cars by 4:30. That is only because we were lucky with the vegetation. 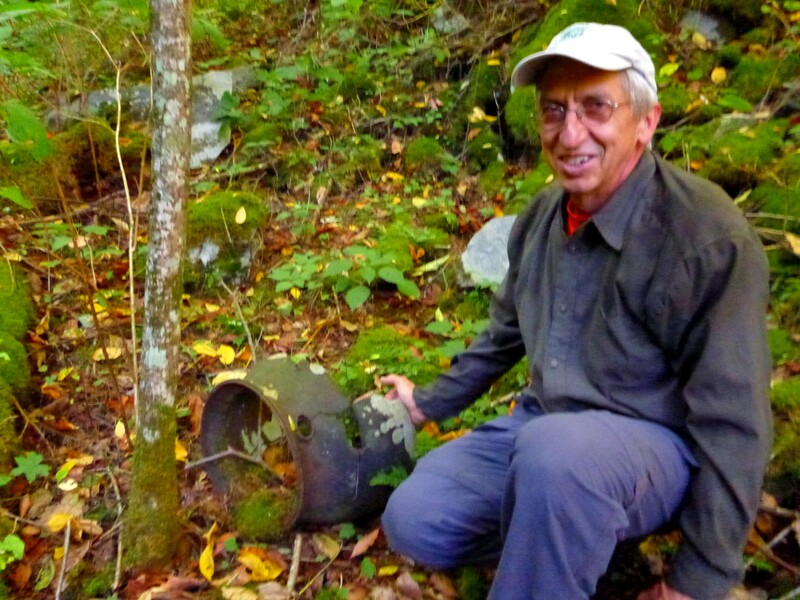 Mark provided us the only writeup he could find of a hike along Mouse Creek, a backpack in 1968 led by Bruce Ketelle of the famous Ketelle hiking family in which they descended Mouse Creek through what was described as “open woods.” Well, things can grow up a little in 44 years. 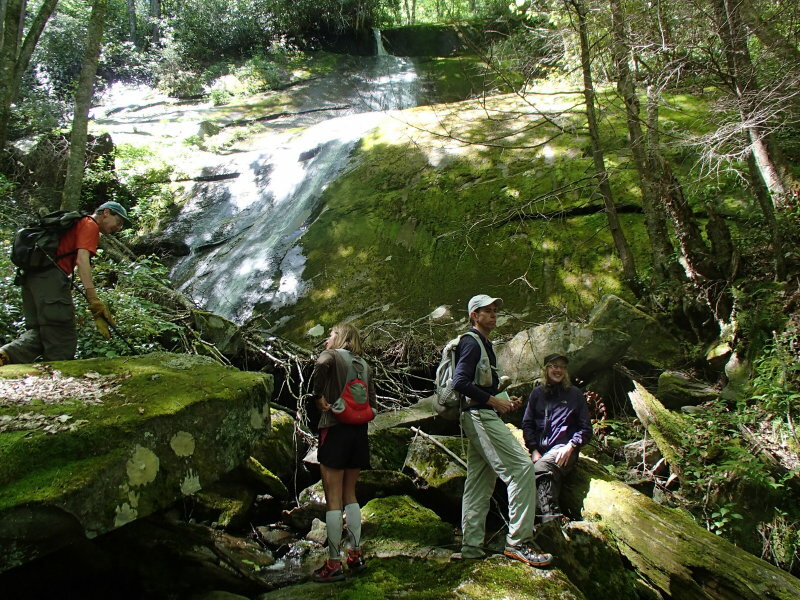 We followed the Big Creek trail for 2.0 or 2.5 miles, depending on which information source you use, passing the notorious Midnight Hole on the stream and reaching the lower Mouse Creek falls where the smaller stream joins the bigger one. We’d already decided that we’d probably continue on the trail a bit further so that we could cross Big Creek on a bridge. The distance to the bridge was further than we expected (or, again, further than information sources indicated), but it did allow us to avoid a wet crossing. At this time of year with fairly low water levels, it would have been possible to wade in a couple of places. In May, with higher water levels, probably the safest thing will be to use the bridge. Big Creek is really more of a river than a stream. 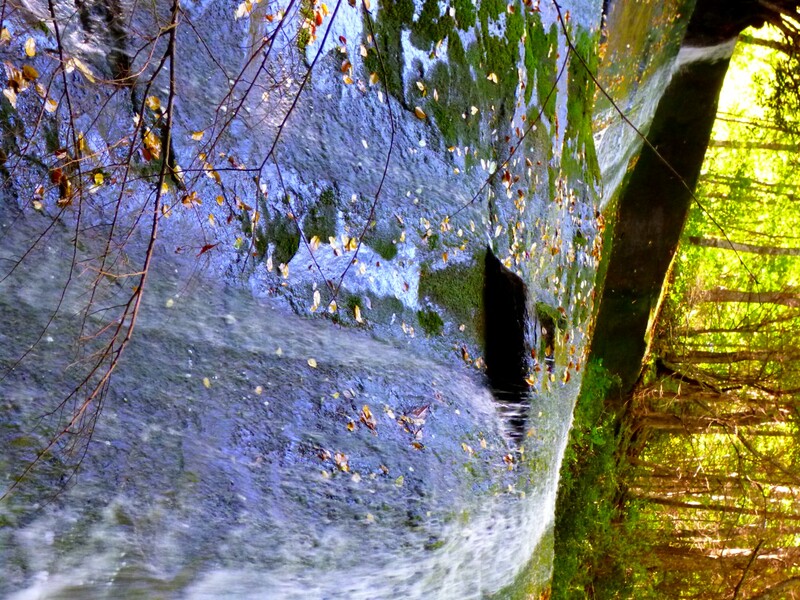 Mouse Creek falls (the lower one) as seen from the trail. We went over the bridge and took advantage of a logging grade to get us back to the falls. Ed and Mark follow the grade. Despite the relatively easy conditions, it still took us a while to work our way back to the falls on the other side of the stream. Mouse Creek just above the falls was a pretty little stream, full of moss-upholstered boulders. Easy rockhopping along this lovely stream. After a half hour or so of making our way up the stream, we had our only negative experience of the day. 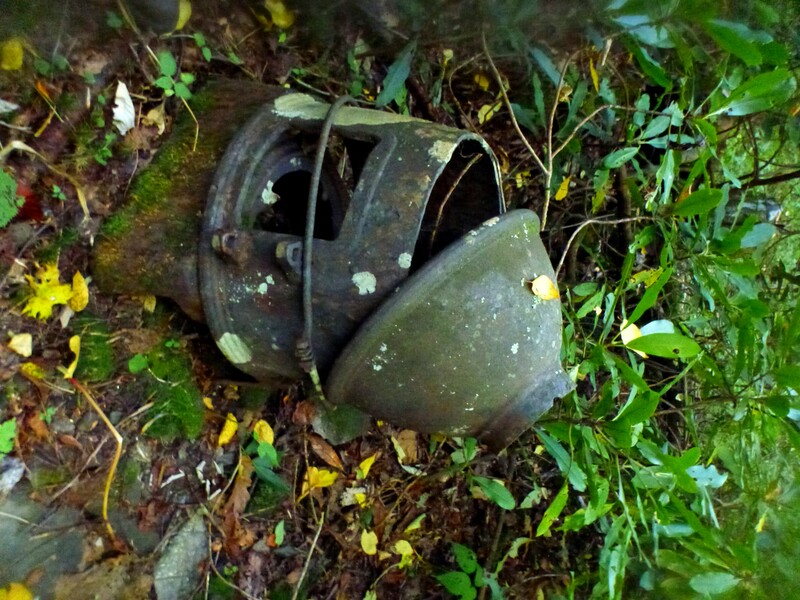 We discovered remains of camping equipment, plus trash and a digging tool that we decided must have been left by a ginseng poacher. There is no other reason anyone would camp in that spot. Not much later, we found far more interesting artifacts, but we had trouble identifying their exact purpose. If anyone reading this blog can shed light on this, we would appreciate it. First of all, we found a rounded item of very thick cast iron, nearly an inch in thickness, that did not seem like a household item but rather part of a locomotive or other segment of a train. Ed displays the item that we can’t identify. There were others we couldn’t identify, either. 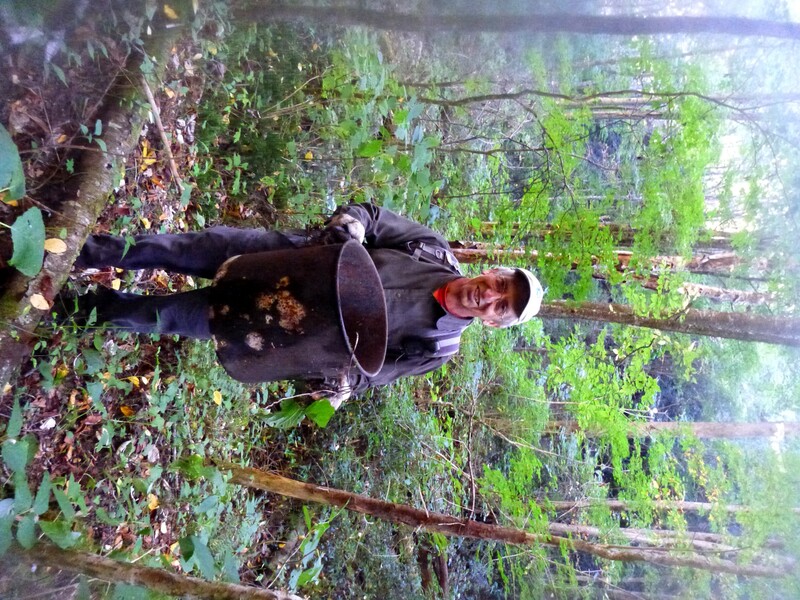 We next found a very large, heavy bucket. Still doesn’t seem like something for household use. Something used in connection with a locomotive boiler? Finally, we found something that looked more like a kiln or something used for charcoaling operations than a regular stove. We continued up the stream. Not much water in the stream here—in this picture you identify it by the contrast between moss and dog hobble. We were about to encounter the highlight of the day—the incredible cascade pictured at top. Our first view of the cascade. 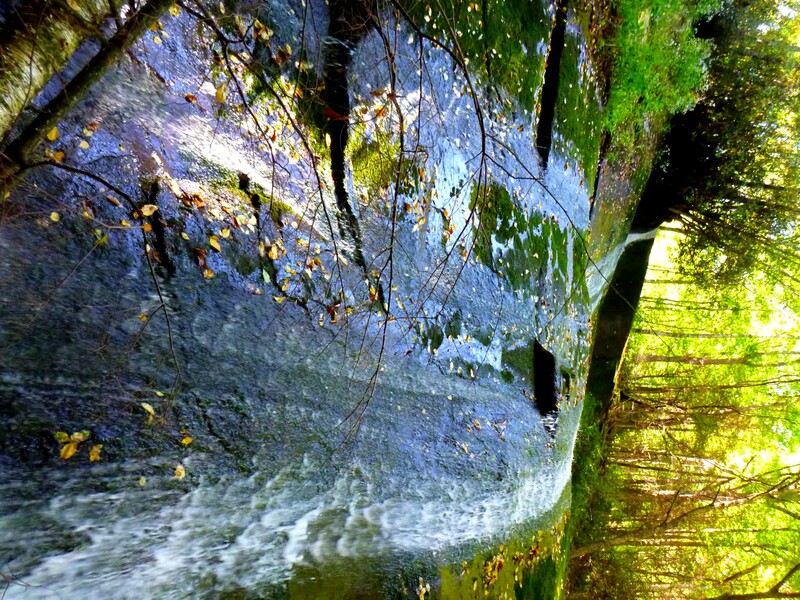 What I liked best was the way the top of the cascade seemed to flow out of the sunshine itself. The top glowed with light. The water came straight out of sunlight. Above this marvellous place where the water flows constantly with practically no one ever seeing it, we found continuing logging grades that aided our climb. 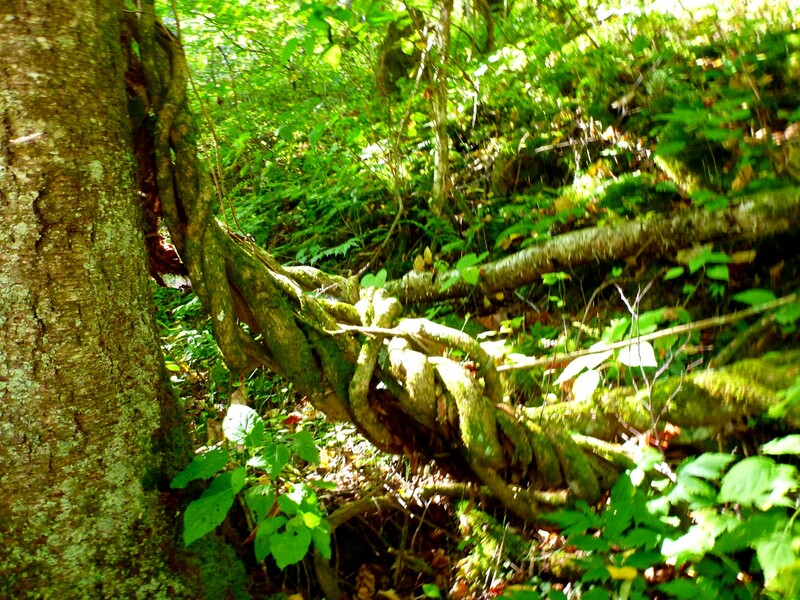 These vines were twined together in a tight spiral. 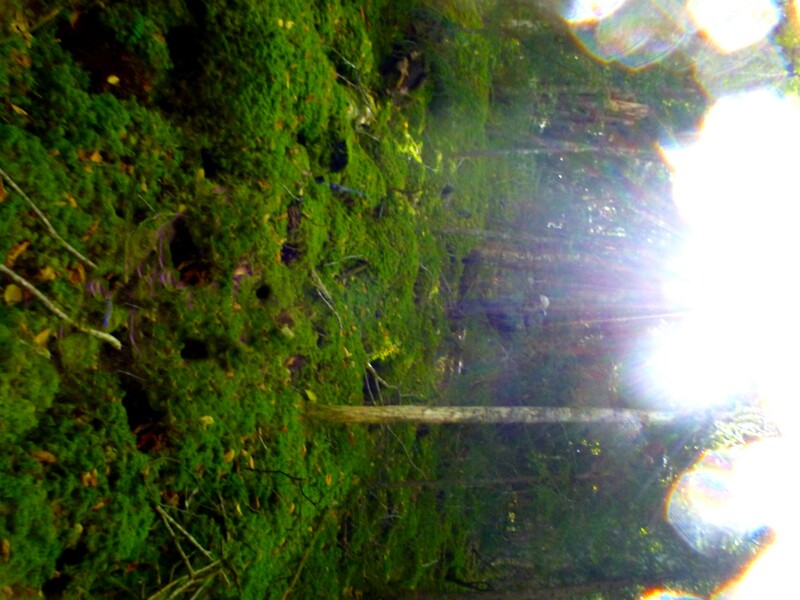 Eventually, on the upper slopes, we climbed through a region of beautiful dense moss. The moss was an extra-luxurious variety. 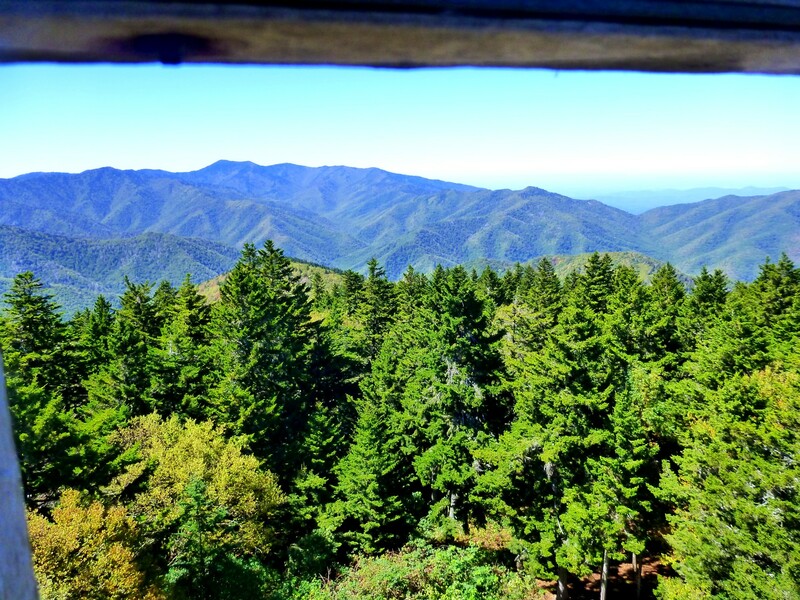 We reached the summit and lunched before climbing the lookout tower, where we had crystalline views in all directions. View to the northwest, as seen through one of the panes of the tower’s cab. We then descended 6.2 miles on the Baxter Creek trail. Total mileage for the hike was around 12. A great day, and two great people to do it with. 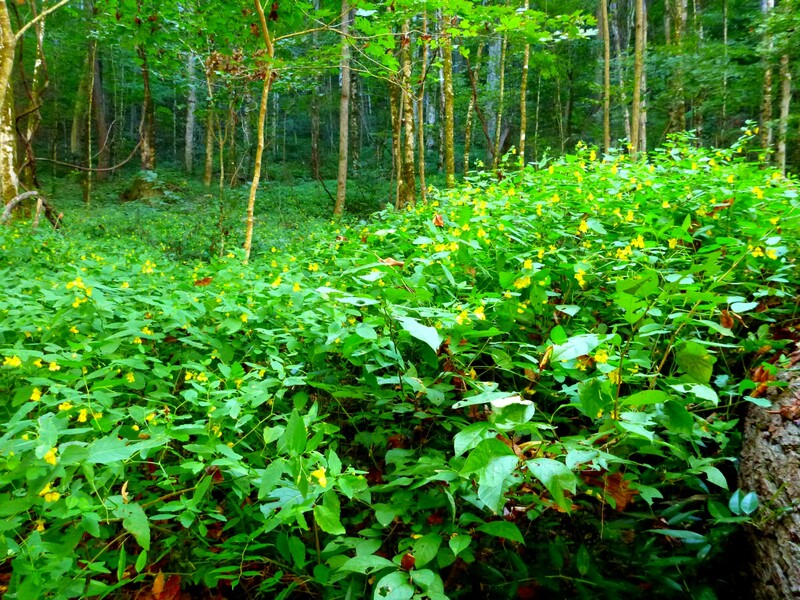 Huge swath of jewelweed near the bottom of the Baxter Creek trail. This hike was, I must say, a bit ill-fated. Literally. One of the people who planned to go on it became ill and could not go, and I myself became ill as I climbed up the trail and had to turn around short of the top. But I would not describe it as a waste of time at all. 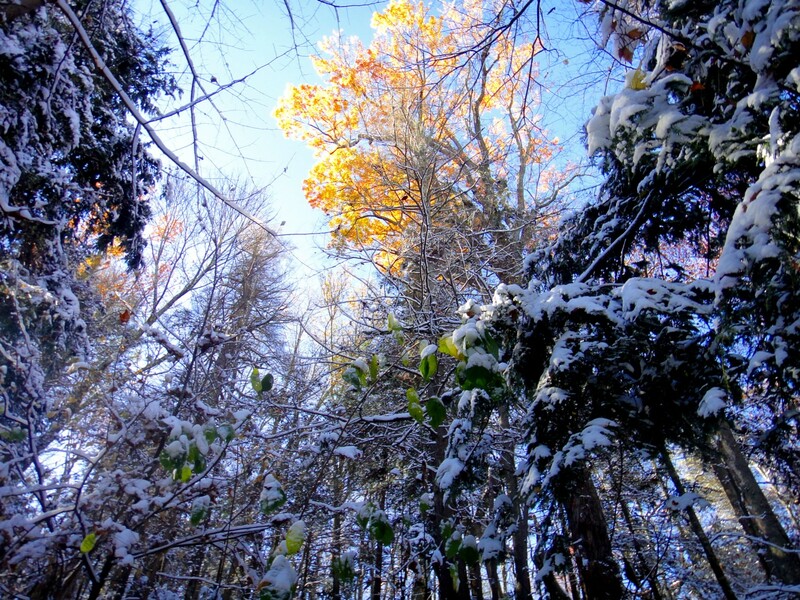 The three of us who went—Chris Sass, Steve Miller, and myself—got to experience some very unusual conditions, with autumn hanging on valiantly up to around the 4000′ level even in the face of a fresh dump of snow. We decided at the start to abandon the original plan of going up an old manway that joins the Baxter Creek trail at 4600′—we figured that with probably around six inches of snow higher up, we just wouldn’t have enough time to get up to the top of Sterling and down again without running seriously short of daylight. We held open the option of doing the manway on the way down if by chance we made really good time. But the hiking gods were not smiling on us this day. From the moment I started hiking, I did not feel well. An hour or so into the hike, I had to confess to my companions that I wasn’t feeling very peppy. I did manage to climb about 3000′ of the total 4100′ vertical before serious muscle cramps set in and I threw in the towel. As it turned out, I was simply coming down with a bad cold. Chris continued on up to the fire tower, and Steve very kindly accompanied me back down to the trailhead. 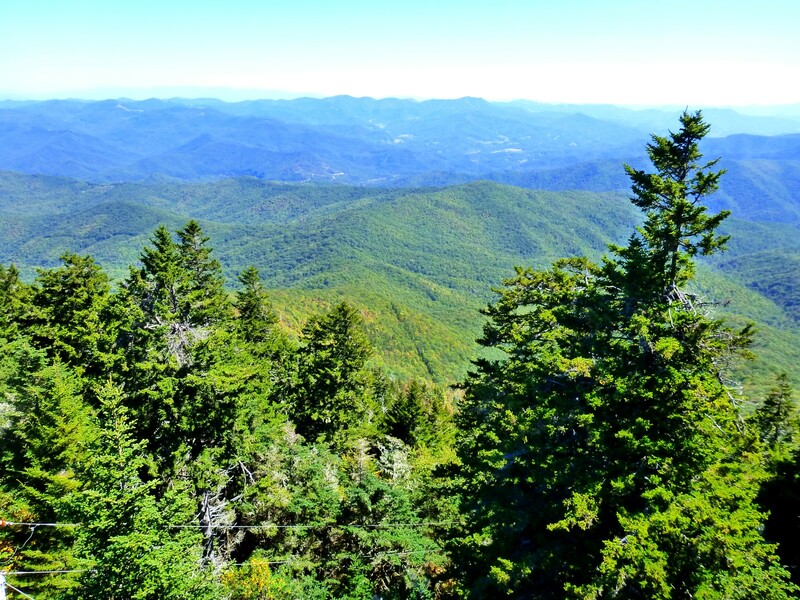 I enjoyed the chance to chat with him, a fellow resident of Asheville who is also a member of the Smoky Mountains Hiking Club—there aren’t that many of us. Steve is originally from Morristown, and he knows all kinds of interesting places to hike up in the direction of Hot Springs, Erwin, and generally around the upper East Tennessee/western N.C. border. Considering the circumstances, it actually turned out to be a pretty decent day!